Today you are in for a double treat — a delicious paleo recipe and an image-heavy post featuring Clemenade and Darla Bear in some of their Autumn threads. Sweet and Sweet, right? It’s like two portions of dessert without any of the bad-for-you stuff! This double-post all came about a few days ago when the three of us girl bears drove out to meet my parents at an orchard for a picnic. I was swooning over the baby bears’ outfits, so I brought my camera along. Little did I know that my mom would be bringing an insanely delicious, seasonal, and homemade lunch for us! Tip: All dry ingredients can also be purchased at discounted prices through Thrive Market!! Preheat oven to 350 F and line muffin tin with silicone (or other) baking cups. Whisk together dry ingredients in a large bowl, breaking up any clumps of flour. In a medium sized bowl, whisk together wet ingredients, then gently and thoroughly combine wet ingredients with the dry. Fold in blueberries. Divide batter between 12 baking cups. 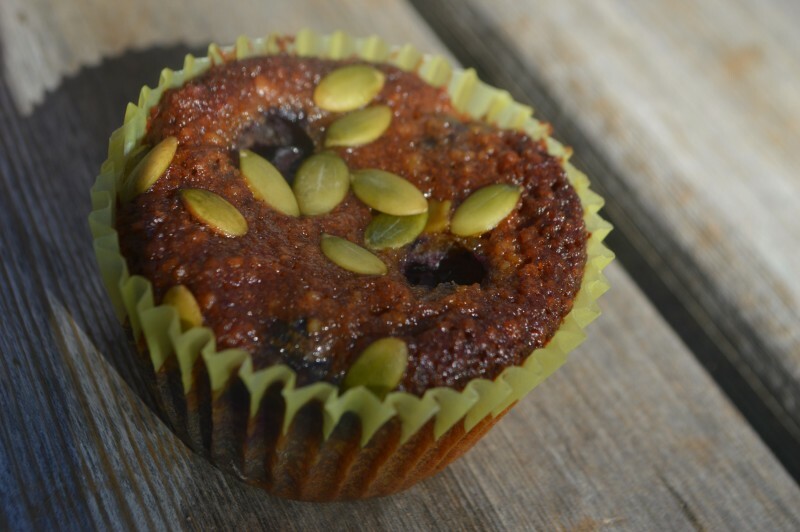 Sprinkle with pumpkin seeds and additional blueberries on top. Bake 25-30 minutes, or until tops are a deep golden brown. This recipe is originally from Thrive Market and has been adapted slightly. Thrive is one of my favorite ways to order pantry health-foods as their prices are all 30-50% off of retail! Be sure to check them out! I decided to move the girls’ sustainable fashion feature over to its own post, HERE. If you would like to see the hip sunsuits and knee socks they were wearing while eating these muffins, be sure to check it out!! Ohh I waaant those sweet little sunsuits! Love! Those muffins look fantastic too!